Learn the basics of Automotive Photography at the acclaimed Mercedes-Benz Classic Car Restoration Center. This five-hour class hosted by OC Camera will cover the basics of creating captivating automotive photographs for personal and commercial use. 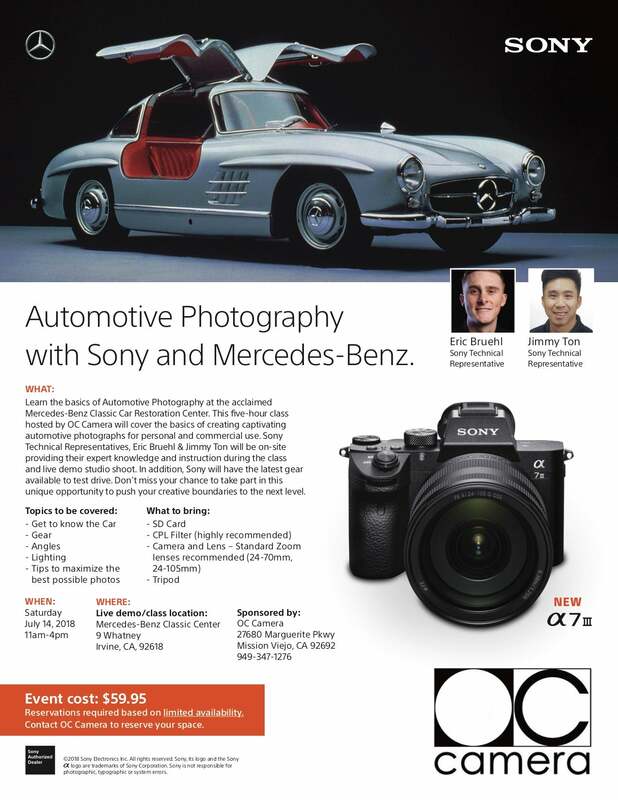 Sony Technical Representatives, Eric Bruehl & Jimmy Ton will be on-site providing their expert knowledge and instruction during the class and live demo studio shoot. In addition, Sony will have the latest gear available to test drive. Don’t miss your chance to take part in this unique opportunity to push your creative boundaries to the next level. Reservations required based on limited availability. Contact OC Camera to reserve your space.